Buying Rotisserie chicken for lunch is so easy and time saving! Especially when you get a good deal on it (like Costco rotisserie chicken)… My kids only like to chicken thighs and drumsticks to eat, so most of the time we end up with a chicken breast leftover. It can be used in so many different ways! You can try in easy rotisserie chicken frittata for breakfast or chicken salad for lunch. Or make a chicken pasta! 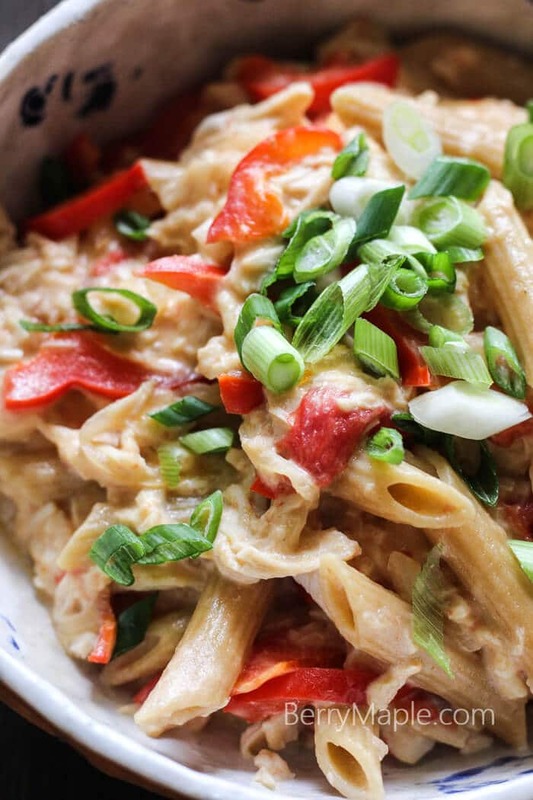 Easy, creamy and time saving too. Throw some veggies and cheese in and enjoy your next delicious lunch! 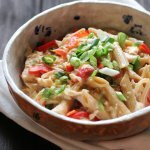 Great way to use the rotisserie chicken leftover, creamy cheesy veggie pasta! Cook pasta according to your package instructions. Heat the skillet with oil olive in it. Add onions and peppers and cook for about 5 minutes, until very fragrant. Add chicken and cherry tomatoes. Cook for additional 5 minutes over medium heat. Turn the heat off and then add cream and cheese, stirring. Now mix it with your cooked pasta just like i did and serve! Leftover rotisserie chicken is always so delicious! I love how easy it is! I buy a rotisserie chicken once a week at least to make my life easier! Everyone likes it, and same with our house, we are left with the chicken breasts! This is so cozy, and bonus, my kids will probably love it! I also have extra roasted chicken to use up too, so this recipe is perfect for crazy weeknights. Love the easiness of this! Can’t wait to make this for the family! Rotisserie chicken is maybe my favorite life hack ever! And your pasta looks so creamy! YUM!!! Such a great idea for using up leftovers. I love how quick and easy it is to put together for those busy weekdays. 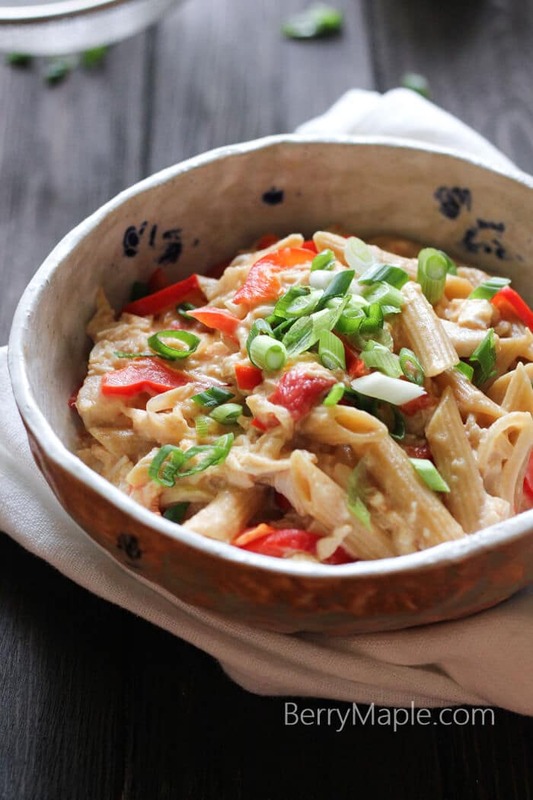 That pasta looks so creamy and delicious! What a great mid-week meal! Whose love language is this not??!! Ha, this looks SO good. Love that cream and cheese and the green onions!! YUM! This looks so quick and easy to make! I can never say no to some pasta! I am always looking for recipes for leftover rotisserie chicken! Thanks! Oh yum! Love all of that cheesy goodness! My youngest and husband would devour this meal. I love how quick and easy this dish is to throw together with pantry ingredients! Leftover magic!! !